Poverty reduction has become the central goal of development policies over the last decade but there is a growing realization that the poorest people rarely benefit from poverty reduction programmes. Microfinance programmes can help poor people improve their lives but generally such programmes do not reach the extremely poor and the chronic poor: casual labourers in remote rural areas, ethnic and indigenous minorities, older people, widows, migrants, bonded labourers and others.To counter this, governments, NGOs and donors have started to mount programmes explicitly targeting the poorest. 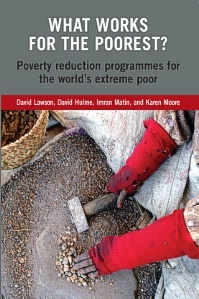 This book is the first attempt to examine such initiatives and identify ‘what works for the poorest’. It asks the questions: what are the characteristics of extreme poverty? how can we target the very poor? how can we ensure that women are not excluded? Through a set of carefully selected and well-integrated papers this book analyses innovative ultra-poor programmes from around the world and explores the lessons that emerge from this new and important body of knowledge.What Works for the Poorest? should be read by staff of donor agencies and NGOs, students of development studies and interested readers who are concerned about chronic poverty.